Like the rest of the blog world, I'm obsessed with pumpkin-everything. 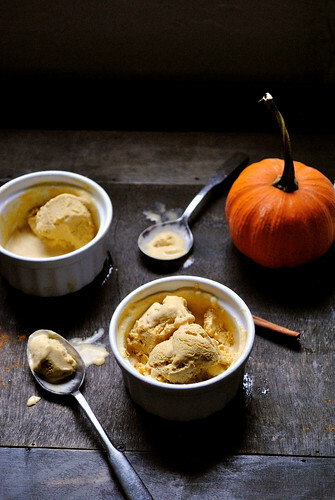 One of my favorite pumpkin treats is pumpkin ice cream that a small, local shop sells every fall. I could eat a gallon of it any day but then I'd end up in a lot of stomach pain. It's so good though, that it would be worth it. 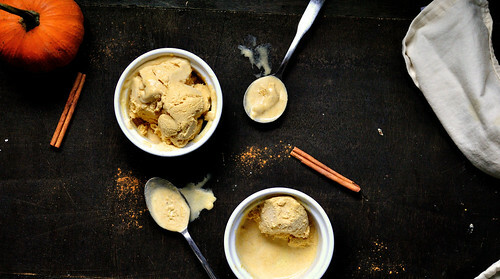 I'm trying to really stick to not eating dairy since it makes me look six months pregnant and I feel awful for a few days but there is pumpkin ice cream calling my name. Instead of running to the ice cream shop and stuffing my face (which WILL happen sometime this season, don't worry), I decided to take matters into my own hands. 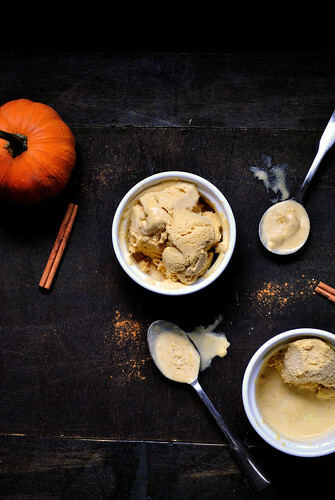 This pumpkin ice cream is dairy-free, egg-free, refined sugar-free, and best of all, it means you can have pumpkin ice cream at your disposable whenever you want. Dangerous? Maybe. 1. Mix all ingredients together in a blender and blend until smooth. 2. Refrigerate mixture until cold, at least 1 hour. 3. Churn mixture in ice cream maker, according to instructions.